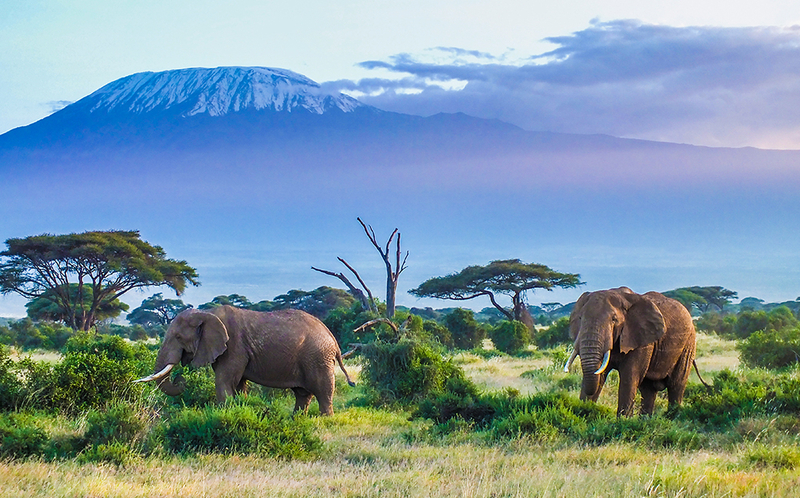 From the top of Kilimanjaro to the plains of the Serengeti, the exotic wildlife, rich cultural diversity and ancient sites, Tanzania is a must on the bucket list of travellers in search of beautiful abundance. Tanzania is the largest country in East Africa, and includes the spice islands of Zanzibar, Pemba, and Mafia. Africa’s highest point, Kilimanjaro, at 5,895 meters is one of its most famous beacons and attracts a lot of adventurous tourists annually. Even though it is situated so close to the equator, this dormant volcano has a snow-capped peak most of the year. Officially known as the United Republic of Tanzania (Jamhuri ya Muungano wa Tanzania in Swahili), this country is a sovereign state in East Africa situated within the great lakes region and three of Africa’s great lakes can be found within its borders – Lake Victoria, Africa’s largest lake, lake Tanganyika, Africa’s deepest lake, as well as Lake Nyasa. This abundance of water leads to spectacular natural splendour from forests to flatlands with a wide variety of animal and plant life. With more than four million wild animals, including 430 species and subspecies, Tanzania has the largest concentration of animals per square kilometre in the world. Of the 2500 bird species that can be found in Africa, over 1100 reside in Tanzania. The Ngorongoro Crater is the largest intact caldera in the world, and the forests surrounding the crater boasts one of the world’s biggest bird sanctuaries. It is no wonder that Tanzania has 17 national parks covering almost 40% of the country, including 7 UNESCO World Heritage sites. One of the world’s top 5 peaks to climb, Mount Kilimanjaro, hosts almost every known type of ecological system, including cultivated land and rain forest, heath, moorland, alpine desert and an arctic summit. The Serengeti National Park is one of the oldest ecosystems on the planet. The park hosts a splendid array of fauna and flora – some not found anywhere else in the world. It is also home to the Ol Doinyo Lengai – the only volcano on earth errupting carbonate lava, a mineral rich lava that is washed down to the plains where it fertilizes the land. Scientists believe that Tanzania is one of the only places left where the possibility of discovering new species still exist. The Zanzibarian Leopard (Panthera pardus adersi), asumed by authorities to be extinct for a long time, are endemic to the island. Zanzibar is an exotic memoir of ancient times and traces of everyone from early explorers and slave traders, missionaries to colonial rulers can be found there. The historical architecture of Stone Town and the diverse ethnic mixture of cultures, colours and sounds in the streets mirror a living encyclopedia of history. Beyond the ancient stories, the sandy beaches and beautiful resorts offer visitors a tropical paradise without equal. Tanzanians are generous, warm, and extremely passionate people. Like most countries in the world, they are avid supporters of soccer. Their national soccer team are currently in Russia, warming up for the 2018 Soccer World Cup, kicking off any day now. I am convinced that the calls of support will go out to their team throughout the country; from the highest snow-capped peaks of Mount Kilimanjaro to the wild plains of the Serengeti, from the ancient ruins of Kilwa Kisiwani and Songo Mnara to the caldera of Ngorongoro where every bird’s song will sound in unison, refraining the chorus of Tanzania’s National Anthem, “Mungu Ibariki Afrika” or God bless Africa.